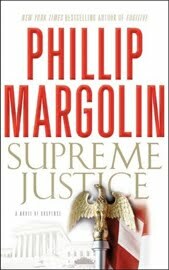 What Phillip Margolin does really well, in my opinion, is create believable characters. No matter how outlandish the action gets – shoot-outs in the Supreme Court, for instance – the good guys and gals maintain their everyman core. Nefarious characters fare less well and are generally just bad guys. Returning to the scene are the characters of Executive Privilege, primarily Brad Miller and Dana Cutler, with no less fantastic a scenario in this story than in that novel, but with their regular Joe and Jane personas intact. Their jobs and talents are anything but ordinary, but you can imagine them as your next-door neighbors. And, okay, their pasts are marred by violence, but you could borrow a cup of sugar from them, no problem. Brad is now a clerk to a Supreme Court justice. When the judge is attacked and almost murdered in the parking garage, she asks Brad to investigate what she suspects to be the reason behind the attack. He draws in Dana Cutler's investigative skills, and the stage is set. Most of the action takes place in Washington D.C., but Margolin ties in his home state of Oregon with a case of a police detective who is accused – twice – of killing her boyfriend. Is the officer innocent and is there CIA or Homeland Security inappropriate behavior involved instead? What is the tie-in with the attempt on the justice's life? Margolin also brings back some of the other honest folk from Executive Privilege. He also introduces a few more – there are a lot of people to juggle in this book – but Margolin makes them all … human. Margolin makes his characters blush and slump, he makes them keep or lose their cool, he makes them flash with insight or grind with frustration. The bad guys, however, are there to be bad guys. With the brief exception of learning a teensy bit about "the Swede," we don't really want to feel sympathy for them or wonder what they stick in the microwave at night. We just want them to get on with the job of being bad guys. In meticulous fashion, Margolin takes us down an investigative path and lays the bricks of discovery one by one. I didn't see the end coming. Like gunshots on a quiet night, Margolin stuns us once, then again, disturbing our inner calm and false sense of completion. I looooved it. And that is what makes Margolin an award-winning storyteller: He tells one hell of a story. I read Naomi Hirahara's first book in the Mas Arai series, Summer of the Big Bachi, and enjoyed it. 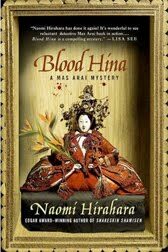 This book, Blood Hina, is the fourth. This isn't quite the surprise the first one was, but it was enjoyable as well. Hirahara nails the voice of an older Japanese man to a tee. How do I know? I grew up in Hawaii. Many of my friends were Japanese – either Nisei (first generation born in the U.S.) or Sansei (second generation born in the U.S.) – and I can hear their relatives who emigrated from Japan in Hirahara's dialogue and descriptions. Mas Arai is a survivor of Hiroshima. He lives in the Los Angeles area and works as a gardener. The Japanese gardener was a cliché in California, so this picture of Mas seems so real. He and his colleagues are victims of World War II in the sense that they belong neither to the culture of the U.S. nor that of Japan. Most of them can't speak English without an accent and don't really know Japanese that well. Each subsequent generation grows closer to the Western culture and further from their parents' beliefs. So it's with trepidation that Mas becomes involved in the problems of his friend Haruo who is about to marry a widow with a problem adult child. When Haruo's wedding is called off and he disappears, it's up to Mas to find him. Haruo is accused by the widow's daughter of stealing a pair of expensive "hina," life-like Japanese dolls, from his former fiancée. The daughter is not exactly credible since has had an extensive history of drug abuse and seems to be taking advantage of her mother, with whom she lives. Nevertheless, no one is seriously looking for Haruo, until Mas begins his search. He uncovers something totally different about the family Haruo almost married into. I was caught by surprise with the ending. It was not at all what I had expected. Most of the book travels at a slow pace, but the ending jumps up at you and barks. I liked that! Sacre bleu, I love Peter Steiner. His writing is poetic and at a higher level than most. 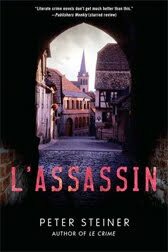 If you have not read Le Crime, L'Assassin's predecessor, you should. Naturally, it was out of print for a while. Why is that? Louis Morgon, an American in his 70s, living the simple life in rural France, is tossed back into his life as a spy. He was summarily dismissed from the C.I.A. decades ago because of the underhanded, petty, egotistical conniving by former Secretary of State Hugh Bowes. Recently Bowes' full and final revenge had been thwarted, and he now wants to finish what he started: the total annihilation of Louis Morgon. In order to evade the American and French manhunts, restore his reputation, find the men who killed the father of a young Algerian boy, repair his relationships with his adult children, and deal with his sorrow over the death of his lover, Louis must again become a man of action. And become incredibly sneaky, too. This is a much more serious book than Le Crime. In this book, Louis shows us he deserved his reputation as a master spy. We watch Louis play an intricate life-or-death game with Bowes. We see him emerge from his dormancy as a crackerjack intelligence agent. And we see the poignancy and tenderness that falls into his life in his twilight years. If only it is not too late to appreciate it. I missed the "Year in Provence" descriptions that were more prominent in Le Crime, but there is still enough of the food and life-in-the-slow-lane talk to satisfy me. The Terrorist is the third in the Louis Morgon series, and it is due out at the end of May in hardcover. The Affinity Bridge is Steed and Emma Peel meet steampunk, with entertaining consequences … and only a few annoyances. What is "steampunk," you ask? If the industrial revolution in the late 1800s and early 1900s went strangely awry that would be steampunk. Take our modern machines that are powered for us by tiny batteries or gas engines or run via chip processors, and imagine that they are activated instead by many mighty gears and that steam pours out of their orifices. Steampunk takes a time that was, in this case the early 1900s, and gives it a never-was technology that clunks and clanks and a culture that's on the verge of change. It's speculative fiction with H. G. Wells as its granddaddy. Steed and Emma Peel are, of course, the iconic "Avengers" from 1960s British television. They married style and outlandish spy-ish stories, and saved the Empire over and over again in a sophisticated and way-cool manner. In this case, our heroes are Sir Maurice Newbury and Miss Veronica Hobbes. As an agent of the Crown, Sir Maurice accepts impossible assignments and makes it work. He has just hired an assistant, the tough-but-tender, coolly intelligent Veronica Hobbes. Zombies are overrunning Britain. Robots (or "automata") are insinuating themselves into polite society. A dirigible ("airship") has crashed. Sir Maurice's secretary's brother has disappeared. Solve these problems. Go. George Mann gives us a largely entertaining, galloping story, despite when it sometimes degenerates into cartoonish play. Sometimes the "little touches" fall by the wayside, however. For instance, when an assailant attacks Sir Maurice, it is implied that his guard (whom the author has endowed with a name – Watkins – instead of just an anonymous status) is knifed. We never find out if he is dead or just injured; Sir M never searches for him. It's a small point, but it is never answered and it bugs me. Also, this zombie thing. A virus has turned people into zombies. Their flesh rots, they don't feel pain, it is hard to subdue them. And they infect people by biting them, making more zombies. Apparently the British have been living with this inconvenience for quite some time. The following is for real: A Canadian graduate student, Philip Munz, used zombification as an entertaining way to present the paradigm of the spread of infectious diseases. In a city of a million people, within "7 to 10 days, everyone was either dead or undead," he concluded. If I were a non-dead, non-zombified person in Mann's story, I'd be saying, "Hallelujah, it's a miracle!" Why can I accept robots without a blink but not zombies? Why do I not think twice when Sir Maurice is subjected to enough pummeling to kill three men while suffering only a modicum of discomfort but cavil when Watkins is ignored? Got me. I read The Tehran Conviction, Tom Gabbay's latest book, enjoyed it, and finally decided to read his first book, The Berlin Conspiracy. And I enjoyed this very much as well! Gabbay has made an interesting period of time (President Kennedy's visit to Berlin) even more interesting. Of course, there's a Cold War conspiracy involved. However, Gabbay's book is more than just a nod and a wink to conspiracy theorists, it's also a thrilling story about an ex-CIA agent who is called back into action to meet with an East German military officer who may have some provocative information about a mole in the CIA. There are lots of agents, double-agents, moles and shifting allegiances and alliances. Series star Jack Teller, the ex-CIA agent, drags his patriotism back out of mothballs to untangle what proves to be the mother of all conspiracies. Also at stake is a piece of Jack's personal puzzle. At the age of 13, German-born Jack left his family and emigrated to the United States. Returning to Berlin after three decades has brought back more than just vague memories, Jack is offered a real connection to his past. Gabbay understands pacing very well. He also balances a complicated political story with a simpler story of people who must live in the shadow of the Berlin wall in the early 1960s. Bravo! Paul Adam has created an enlightening, delightful story around a contemporary violin maker in Italy. Paganini's Ghost is part musical arcana made accessible by the author's engaging writing style and part intelligent mystery. Gianni Castiglione is a premier violin maker. He is a man who enjoys life in an isolated home and workshop set just outside of Cremona, Italy. The story begins when a cavalcade of official vehicles pulls up in front of Gianni's home. They bear Il Cannone ("The Cannon"), the powerful-sounding violin created by Guarneri in 1743 and played by fabled violinist Niccolò Paganini in the early 1800s (fact). Among the violin's entourage is the young man who is scheduled to play the violin that evening (fiction). They have come to Gianni because of an annoying buzzing sound that has developed when the violin is played. In the process of repairing the violin, Gianni befriends the shy young player, Yevgeny Ivanov. Although he was once a child prodigy and is now a young man with a bright future, Yevgeny's life is not all champagne and caviar. His dominating mother has taken over both his musical and his personal lives. After a shady art dealer from Paris is murdered and a piece of paper torn from Yevgeny's music sheet is found on him, Gianni and his police friend, Antonio Guastafeste, seek to determine Yevgeny's involvement. When Yevgeny disappears and a small golden violin case is discovered among the murdered man's possessions, the case becomes increasingly complicated. Gianni and Guastafeste must find Yevgeny, the golden violin that belongs in the case, and an elusive missing Paganini serenade. Their search takes them around Italy and to Paris and London. British author Adam often stops to savor the Italian life in the process of telling his story. Gianni simmers sauces and slices savory cheeses in his little kitchen. Guastafeste concocts deadly little cocktails and Gianni pops the cork on delicious red wines. Guastafeste tears down the roads in his car, unmindful of the posted speed limit; Gianni rides with his eyes closed and his fists clenched. And everywhere there is the magnificent centuries-old architecture. Oh, yeah, it's Italy, all right! More's the pity that there's no accompanying CD of the music described in the book, but Adam writes with verve of the pleasure of playing or listening to it. In The Rainaldi Quartet, Adam's first Gianni Castiglione book, a member of Gianni and Guastafeste's amateur quartet is murdered. Paganini's Ghost takes place a year later, and the remaining members of the quartet have not played together since their friend's death. As a thank you for repairing The Cannon, Yevgeny fills the vacant spot and heals the sorrow of the remaining quartet members. I would love to have been there. Oh, wait, it's fiction. Rats! The central mystery involving the tiny violin and the missing music is rich with real historical references, but the heart of the book lies in the heart of the main characters. Goodness abounds and there is no doubt that simple-minded, avaricious Evil will be vanquished by the finale.